Please, look at this screenshot: On a first screenshot in 1 occasion tree branches is ok, but as you can see on 2 occasion, thin branches disappears and branch crossings looks like big knot, and in a distance this effect intensifies until only very thick branches and intersections remain visible. I understand, that in real life for eye it is harder to see thin branch on a distance, but it is true if this branch is single. If there is many branches they looks like dark blurry web, but not disappears. This effect also appears with trees in leaves, while in real life dense tree with leaves in a distance still is a dense green ball, not a fish skeleton with remains of meat! 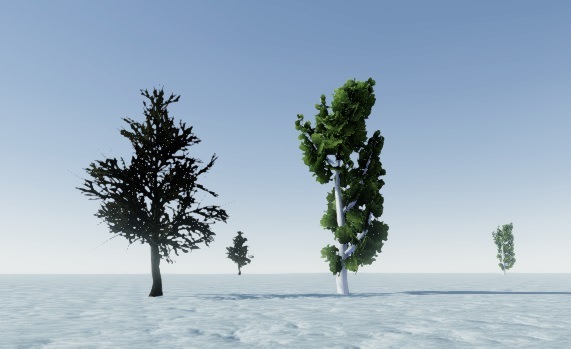 Look at next screenshot: So, how can I make trees looks good in not so far distance (like on a figure 2 and 3 on first screenshot) without billboard?